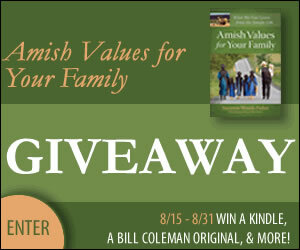 I love learning about the Amish, so I was thrilled to get the chance to review this book! I loved how each chapter was short and contained one lesson, so it could be read as a daily devotional if desired. Each chapter contained a story with the lesson, a review with a few questions, and some random quotes from readers. I loved each lesson, but I especially loved the ones that focused on spending quality times with others, whether it was family or friends. While I do often spend time with my friends, I tend to neglect my family, and I focus way too much on myself at times.